Choose from our beautiful collection of premium quality dark wooden blinds and bring the beauty of exotic dark wood to the inside of your home. 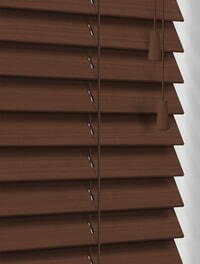 They are the ideal way to create a naturally dramatic look at the windows. Each blind is hand crafted and custom made to order for that perfect fit using the finest quality sustainable basswood, faux wood and components. 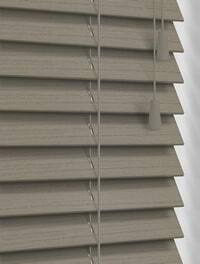 Stylish and functional, our faux and real wood blinds bring a warmth and natural elegance to any room’s decor. 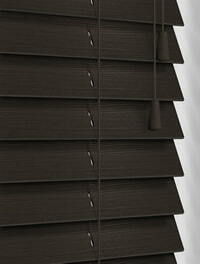 They offer an excellent solution to privacy and light control. Just tilt the horizontal slats to the desired angle to allow as much or as little sunlight into the room as you require. Easy to clean, simply wipe them down with a damp cloth or dust them regularly. 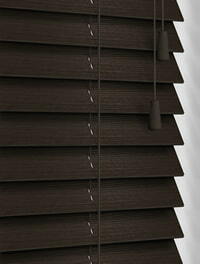 These stunning bespoke dark wood blinds will beautifully enhance any interior decor whether classical or modern, and blend perfectly into many colour schemes. You can always customise them by selecting a light or white coloured trim for a real contrast, or the tapes or trim of your choice for a truly unique look. They are available to purchase online in a range of fabulous brown and dark brown shades and delivered direct throughout the UK at cheap online prices.